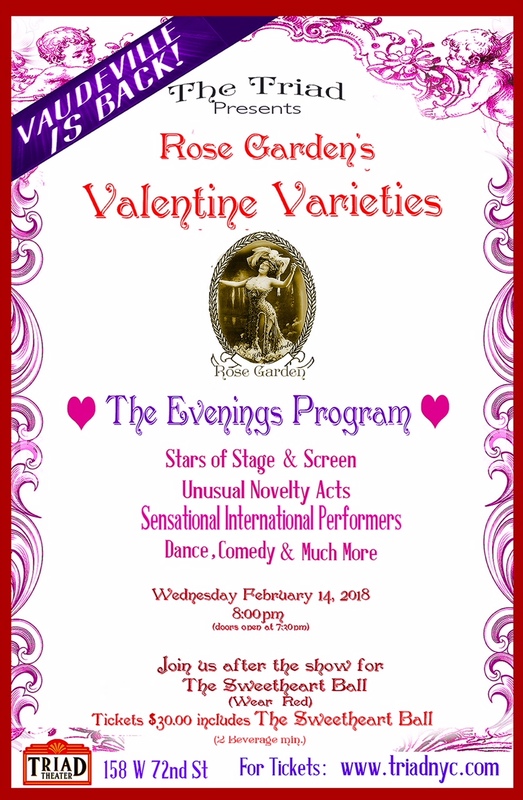 It is thrilling to have been asked to be part of this Vaudeville Show on Valentines Day - February 14th at 8pm! I’ve been doing the “vaudeville thing” for ever! WE SOLD OUT THE TRIAD THEATER ON NOVEMBER 18! Don't worry . . . watch this space for our next show date! 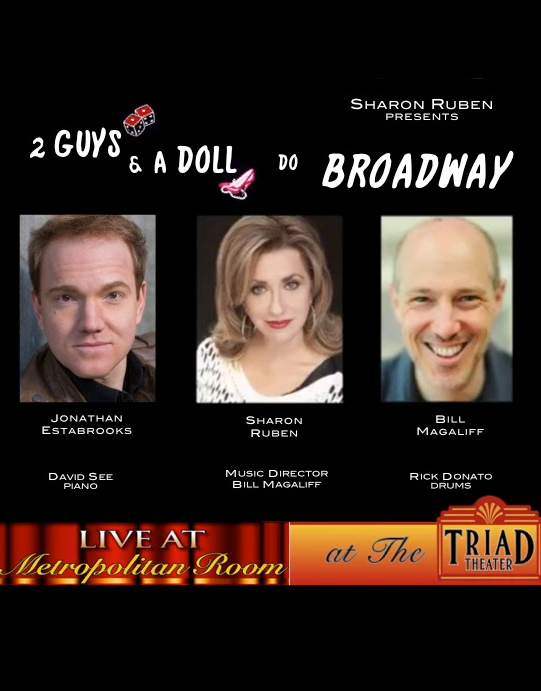 Saturday, November 18th at THE TRIAD THEATRE (158 W 72nd Street), Sharon debuted her new show "Two Guys & A Doll" with vocalists Jonathan Estabrooks, Bill Magaliff , pianist David See and drummer Rick Donato. In this Broadway journey through life, (including over 50 Broadway favorites), Sharon tells stories of her life on stage and off from 30+ years in the business. SHARON RUBEN has brought her cabaret act to Feinstein's, Tuscany, Italy and opened the season at The Ocean House. Trained at the Juilliard School of Music, Sharon has performed at Radio City Music Hall as a principal vocalist, and in many Musicals including: Hal Prince's Fiddler On The Roof, Kiss Me Kate, Oklahoma and Carousel with Howard Keel. Her latest musical comedy, storytelling one woman show "The Best is Yet to Come" played to packed houses at The Laurie Beechman Theater in NYC and Florida. Sharon was a guest on the Dr Oz Show in February 2017 in the episode FAKE NEWS. Baritone JONATHAN ESTABROOKS has been hailed by the New York Times as a 'robust baritone' with a rich and versatile timbre leading to performances around the world. He has appeared with major orchestras around including Toronto Symphony, Seattle and Vancouver Symphonies with Steven Reineke, the National Arts Center Orchestra under Pinchas Zukerman and at Carnegie Hall and the Kennedy Center. Most recently, he traveled to Australia and New Zealand as a headliner in the classical-crossover production ‘Encore’. BILL MAGALIFF has engaged in live theatre and music for the past 35 years as a music director, director, conductor/arranger, accompanist, teacher and performer. Past work includes the Jerusalem English Speaking Theatre, Cider Mill Playhouse, and Palistage Youth Theatre. Currently he directs and arranges for the vocal group SHTYX and the band New Relics, is the music director for the original musical Holding On, leads community singing through Come, Let’s Sing! and is producing the second in a series of parodies that interpret the bible in a human and humorous way. DAVID SEE is currently staff pianist at Mannes School of Music at The New School, Highbridge Voices and Apotheosis Opera. He has previously been principal keyboard for the Symphony of the Mountains (Kingsport TN), collaborative pianist at East Tennessee State University, Middle Tennessee State University, and with NYC’s Tapestry Choir, and has also had a varied career as piano teacher, organist, composer/arranger, and keyboardist for musical theater productions and stage bands. A member of New York Composers Circle, his original compositions include “Be On Time” for a cappella chorus, premiered in 2017 by C4: The Choral Composer/Conductor Collective (in which he also sings bass),The Argument Rag for viola and piano, Piano Concerto premiered by Symphony of the Mountains in 2001 with pianist Gary Hammond, and a series of piano duos that he performs with his wife Lynn Rice-See. He holds a Bachelor of Music from Oberlin College.